It thrills my heart to watch the day unfold in such an array of soft pastoral colour. Every season has its beauty. When we live in the moment with Mother Nature she has the power to nurture our souls and help us rise to whatever challenges we may be facing. And sometimes she simply loves to remind us how much is ours to enjoy if we will just stop long enough to take it in. During this busy time of celebration may you find time to commune quietly with the beauty of nature. A year ago I took a chance on my first gallery exhibit in Toronto and 10 days ago, on my birthday weekend, I collected my first artistic award in New York City. The video photo journal is linked in the menu. It’s short. If you have a moment, please check it out. It represents the beginning of a new chapter in my creative life … and is a gentle celebration of women who work behind the scenes to keep the equestrian world humming. As a woman-of-a-certain-age finally able to pursue my passion for fine art photography, let me just say this … you’re never too old to dream. Never too old to learn how to celebrate your own achievements. Age is, after all, just a number. We’re more likely to awaken to our potential when surrounded by a good support system. I feel like I’m living on the edge right now. So much change. So much uncertainty as my husband and I pursue the path of our dream. For a girl who likes her feet firmly planted on the ground it feels pretty disorienting to live this close to the edge. It rather reminds me of our 2010 adventure on the Hakone Ropeway in Japan where in order to enjoy spectacular views of Mount Fuji I had to override my fear of heights and enclosed spaces. It didn’t help that at the time I was, unbeknownst to me, heading down the path of debilitating adrenal fatigue. It made my anxiety over the experience all the more acute. Still, with the help of my supportive husband and our two dear travel companions, as well as Rescue Remedy and the beautiful music of Jacob Moon, I made it work. It was worth it to get to see Mount Fuji, however shrouded, above the clouds. The path to our dreams takes us to the edge of our comfort zones constantly. It can be scary to dip our toe in the waters of the unknown, and this is why so few people ever achieve their heart’s desire. Surrounding ourselves with supportive people and holding dear a few creature comforts can help us negotiate those tough moments experienced on the edge. Our dreams need to know they’re worth the risk. This image was captured late last summer while I was engaged in the facilitated equine experiential learning certification program. I love this moment. 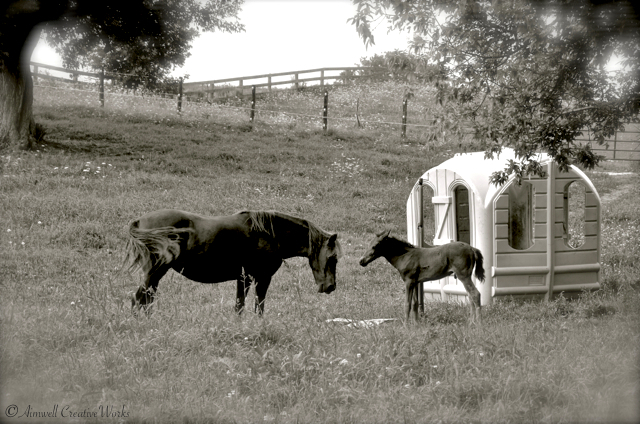 It seems to me Aria and her two-month old foal, Dancer, are having a teaching moment ~ a heart-to-heart. Horses are completely open with each other, and us, all the time. They need to be. Their survival depends upon it. Allowing my heart to be open in the presence of the sensitive and non-judgemental horse is one of the most soul satisfying experiences I’ve ever experienced. Being able to facilitate this with others who have a desire to heal their lives is something I look forward to as the future unfolds. In the meantime, I continue to engage in, and enjoy, my own heart-to-heart with the horses.